Mike Dumelow captured this image of the conjunction of Jupiter, Venus and Mercury on the evening of 26th May 2013 using a Canon EOS 1100D camera. Jupiter is on the left, with Mercury above Venus on the right. The church at Breedon on the Hill is visible on the lower right with part of Derby behind it. No three planet conjunction will be closer until 2026. Mike Dumelow captured this image of the conjunction of Jupiter, Venus and Mercury on the evening of 25th May 2013 using a Canon EOS 1100D camera. Jupiter is just above the tree line to the left of centre and Mercury is above Venus on the right. Claire Spencer also captured this image of the conjunction of Jupiter, Venus and Mercury on the evening of 25th May 2013. She used a using a Panasonic DMC-FS16 camera. 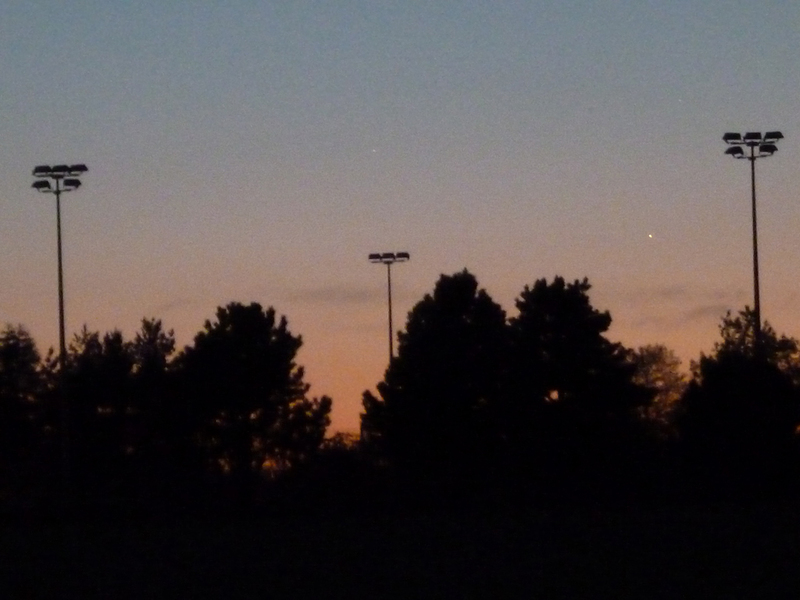 Jupiter is above the centre floodlight with Mercury above Venus on the right.